will not be shared with any other group. MoSt supporters ROCKED the vote! Not bad for our first concerted effort! 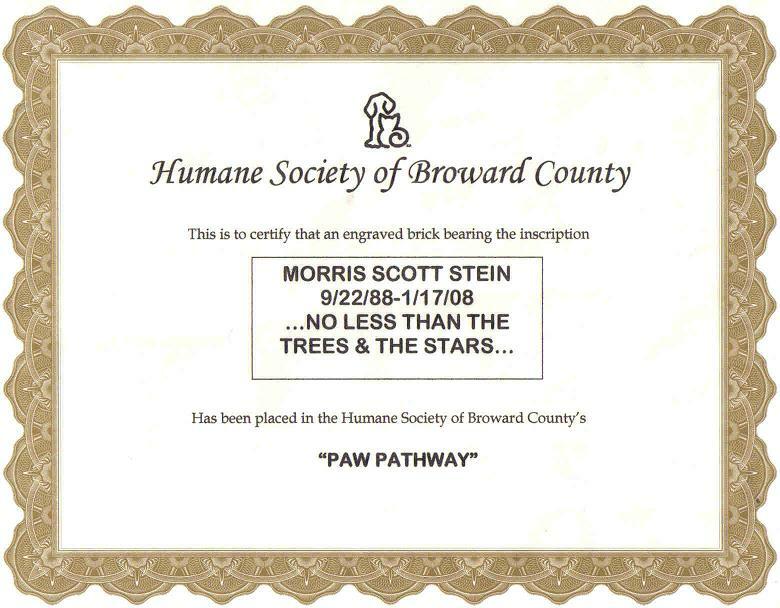 Morris' dog Lily was adopted from Miami-Dade Animal Services Shelter in December 2006. "“The greatness of a nation and its moral progress can be judged by the way its animals are treated” - Mahatma Gandhi "
Special thanks to the residents of Federation Plaza for their generous contributions to the Morris Stein Foundation (MoSt) at the February 2009 Pizza Luncheon. A year after her son's gunshot death, a griev-ing mother honors his memory with a cam-paign to teach young people firearms safety. In the house where his mother cries for him and laughs about him and sits for hours at the computer watching her only child's image scroll by, Morris Stein is very much alive. She listens to his voice, sees him move on cell-phone videos, lingers over his Facebook page. Frame by frame -- as a toddler, a Little Leaguer, a bar Mitzvah boy and high-school graduate -- he matures in hundreds of archived snapshots. POST YOURSELF DOING "THE MoSt"
Elise Vieth discovered that Starbucks dumps leftover baked goods, slightly bruised fruits and other items daily. One manager of a Miami Lakes location agreed to allow daily pick ups of the items for donation to food banks or other places. Anyone who has the time and energy to pursue this with other locations is encouraged to do so. MoSt will provide you with the necessary letter to present to your local Starbucks. It may be possible to earn community service hours doing this. Nadav Regev is working with FAU's chapter of Hillel and the Palestinian student organization on an event to promote tolerance and diversity. Isaac Mizrahi is at Duke working to have MoSt chartered as it's own group, among other things. Jessy Schiffman is planning a run. Oren Tuvia (FSU) says: Tropical smoothie sells reusable cups so we can save the environment. thought it was a great idea so i bought a cup it was cheap 4 dollars and you get 50 cents off every smoothie. I also just recently learned that starbucks does the same thing. Its a great way to save the environment by not polluting the world with more of those styro foam and plastic cups. Did you know that when bottles are recycled, their caps are often cut off and thrown away, ending up in landfills, oceans, rivers, and too often, in the mouths of baby sea animals? This causes the animals to either choke or end up with bellies full of plastic, which eventually leads to death due to malnutrition, explains Michael Braungart, a toxicology expert and engineering professor at Germany's University of Lüneberg. So a few years ago, Braungart approached the natural-beauty company Aveda for help with this problem. "Our solution was to prevent the plastic caps from getting into the ocean altogether," says John DeFausse, vice president of global packaging for Estée Lauder, Aveda's parent company. "So we created a second life for the discarded plastic by collecting caps." Aveda stores are accepting any and all of your hard plastic caps (e.g.from bottles of water and soda, laundry detergent, facial cleansers, shampoo, etc.). To participate, visit aveda.com/stores to find an Aveda store location near you. Don't see one within driving distance? Mail in your caps instead to: Aveda Re-Cap Program, ACA Waste Services, 40 EADS Street in Babylon, NY 11704. In eighth grade, Ruben Leon and Morris Stein played on the same flag football team. A year later, when both were enrolled in Cooper City High School , Leon was diagnosed with ulcerative colitis, a painful intestinal disease that continued to worsen. Five years later, Stein was killed in an accidental shooting. They never really knew each other beyond being teammates, and eventually they lost touch. But on Saturday, Leon honored his lost teammate in the best way he knew how: playing ball. Sam Touisithiphonexay hosted a Halloween Event Oct 29, 2008, for his martial arts school in Sunny Isles and included The MoSt Foundation in the festivities. Chad Prince and Hillary Blasberg manned the MoSt table with laptops to facilitate voting through the foundation's link for the Miami Dade Animal Shelter in the Care2.com contest. They also had MoSt organic t-shirts with them to sell to supporters.